Thick, groomed, defined brows are the hottest new trend. Say goodbye to over-plucked, thin, space brows because bigger is better and behind any great set of brows, is a brilliant brush that does all the work. It’s important to invest in a good quality eyebrow brush because you want to be able to create pristine lines and do it effortlessly. Using a brow brush is easy too, apply the product with the brush as you would a pencil or paintbrush, it’s that simple. A lot of brushes also come with a spoolie or comb wand on the other side, this is another way to get soft, bushy brows and an even application. Here is a list of of some of the best eyebrow brush in the business. There’s a brush for everyone! If you’ve never heard of Anastasia Beverly Hills (ABH), then you have been missing out severely. This woman is the leader in brow products and has taken over the world with her brushes, brow gels, brow creams, and powders. The Anastasia eyebrow brush has a proven long lifespan and is dual sided, with a firm and packed synthetic hair brush. The other end offers a spoolie for perfect brow shaping and blending. Anastasia eyebrow brush can be used with powder products or pomade gels. You know you can trust this brush simply because of the brand. Anastasia has consistently curated best brow brush designs that can suit all women. 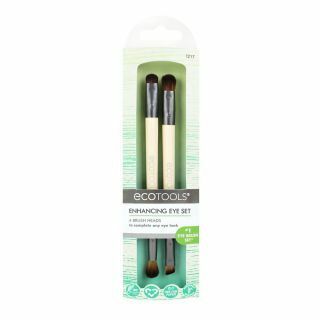 EcoTools is another major brand in the beauty industry that is known for its natural products. One of the benefits of this brush is that it comes in a set, so in fact, you are getting two four brushes for the price of two. Each brush is dual sided and this will allow you to create smoked out evening looks as well as simple day time eye looks. You can also shape and define your brows with the other brush. The set includes a Shade and Define brush as well as a Blend and Smudge brush. Another fantastic thing about EcoTools is that they make their products from recycled Aluminium and plastic. The packaging is made from 100% tree-free paper and with 20% cotton and 80% bamboo fibers. The brush handles are made from bamboo which is one of the fastest growing plants in the world. So not only are you investing in your brows, you’re investing in a greener planet too. Shade brush: apply eye shadow all over lid with the soft, tapered bristles. Define brush: use angled liner end to line and enhance eye shape with brow product. Blend brush: blend brow product to eliminate streaks and harsh lines. Keshima is a lesser known brand, but don’t let that deter you from trying it out. The Keshima brush also comes with both an eyebrow spoolie and an angled bristle brush for defined and strong arched brows. The bristles are high quality and synthetic grade AAA hair. The wooden handle is strong but light, perfect and comfortable to use for the brow area. Interestingly, unlike other brands, Keshima is confident that they have one of the best angled eyebrow brush, so much so that they offer a 90 day refund if you’re not happy with the product. Many customers compare this brush to higher end ones like ABH. So if you’re looking to start off your brow journey and don’t want to spend a lot of money, this is a great alternative. If you’re thinking of building an eyebrow brush set, look no further. With Lamora, you have the option to buy all the brushes you need, for the price of one. This set included 3 professional grade synthetic eye brow brushes. You will get a small eye shadow brush, a double ended makeup brow brush with an angled liner and spoolie, as well as a flat definer brush. Something that makes this set stand out is that it lets you shape, blend, and groom your brushes all together. Users rave that this set is perfect for professional makeup artists, or even beginners. For the perfect brow, apply the brow product using the angled brush in gentle strokes, mimicking hair. Then, use the eyebrow spoolie to brush out any harsh lines. Using the flat definer brush, pick up a small amount of concealer from the back of your hand and apply a thin line around the brows, creating a clean frame for more defined brows. Using the eye shadow brush, simply blend out the concealer. One of the best things about purchasing online is the wide variety. Again, if you’re not interested in making a dent in your pockets, this is a fantastic alternative and great value for money. This brush set actually includes brushes that cater to the entire eye! So you can create beautiful eye looks with one perfect pack of brushes. Included is twelve brushes including eyeshadow brushes, blending brushes, bent eyeliner brush (for perfect precision), eyebrow brush and concealer brushes. They all come in different shapes and sizes so you can create the perfect look. Like more expensive brands, the design is stunning and comes in rose gold and black handle appliqués. Despite being cheaper than other sets, the brushes do not shed and are soft to the touch. Duorime includes 10 brushes that are made from vegan, synthetic hairs, making for a soft yet dense brush that is perfect for picking up colour. Customers say that the brushes do not shed and can be compared to higher end brands. Sleek packaging, gold rimmed, in a stunning box, less than ten dollars, what more could you ask for? This synthetic angled brush also comes with a spoolie brush and is marketed to be dense enough to hold its shape as you define and create your beautiful brows. Docolor brushes are easy to clean and the company offers a money back guarantee if you’re not pleased with the performance of the brush. You may consider this to be a simple brush, but sometimes less is more. What sets this set apart is the fact that it comes with a spoolie, and it also boasts three unique angle brushes. Again, with synthetic fibres and AAA grade hair, each brush is designed in the USA by experts to allow you to create symmetrical, defined and perfectly filled brows. Included in the set is a small precision angle brush to shape your brows, a premium duo brush with an eyebrow spoolie and an angle brush, and a wide angle brush. Packaging wise, the product comes neatly packed in a white box, and is presented as a high end purchase unlike some other competitors. Real Techniques is a leader in drugstore makeup products. It is tried and tested by consumers all over the world who often prefer it to higher end options. This set is unique in that it contains a pair of stainless steel tweezers with flat edges to help you groom and shape your brows. The stainless steel brow scissors have rounded tips to allow you to trim fine, thin hairs. A spoolie brush, an angled brush, and a wide, shadow brush to blend out any concealer is also included. This is a perfect set for those of you that want an all in one pack. Grooming your brows never looked easier. Real Techniques brand is popular all over the world, created by sisters Sam and Nic Chapman from the UK, Real Techniques has taken over the beauty industry. This is a wonderful option for women who are reluctant to try other online brands because it is a world renowned company known for putting out amazing products. MAC cosmetics is one of the leading cosmetics brands in the world and are renowned for their product quality. The MAC 266 is one the best angled eyebrow brush that can create sharp precise lines with ease. The MAC eyebrow brush has a wooden handle, nickel-plated brass ferrule and a mix of natural and synthetic bristles making it great for cream and powder products. The bristles are perfectly arranged to create a perfect angle when shaping your brows. The soft bristled MAC eyebrow brush is designed to fill in brows for thicker and fuller brows. You can achieve a gorgeous brow with ease as the brush is good for shaping and shading both. You will be amazed how easy it is to apply gel eyeliners with these. The only snag is the hefty price tag for this best brow brush when compared to other brands but rest assured you get what you paid for. It can be confusing at first to select the right type of eyebrow brush for your desired look. Here we take a look at some of the popular brush types and their purpose. This brush is designed to distribute powder evenly for darkening the brows. 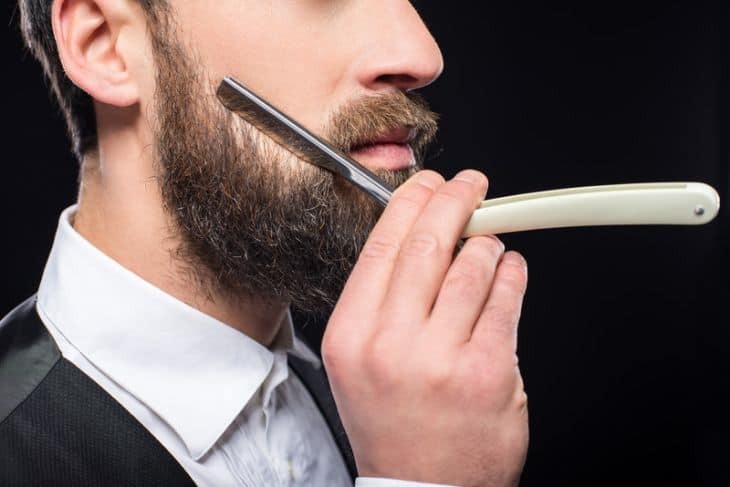 The tip is in the shape of a hand and usually made from real hair. You can easily take and spread powder along your eyebrows. A Spoolie brush is probably one of the least used brushes mostly due to the fact people are confused how to use it. It looks like a mascara wand with tapered head and soft bristles. They can be used to brush your brows into place before you begin to fill in and to even out the color after filling in. They are also useful in removing any mascara clumps and separate eyelashes. The spoolie is also helpful in trimming brow hair thanks to its tapered shape. The angled or slanted brow brushes are perfect for applying thin lines with precision. It has stiffer bristles that can place and fill the powder in brows with ease. The angled design ensures you get well defined brows as it reaches even the thinnest areas. In case you are using a stencil then this brush can be used to fill in the gaps. This is a combination brush which has a comb on one side and brush on the other. The comb is also useful for those with thick hair who can use it for daily grooming without spending for a separate comb. It can remove any clumps and line the brows up for filling or shaping. The dual end type of brushes comes with 2 heads at either ends of the handle. One end is an angled or puff brush while the other head is a spoolie. This reduces the need to carry a lot of brushes especially if you travel a lot. Whatever you chose, know that your brows will be in good hands! The Anastasia eyebrow brush is our favorite in this list of best eyebrow brush. Always do your research when investing in beauty products because at the end of the day, you get what you put in and when it comes to your brows, the frames of your face, you want to give it all that you have got!